The relation of science fiction and the utopian tradition has been a point of some contention among critics of either field—Darko Suvin, for example, famously argued that “utopia is not a genre but the sociopolitical subgenre of science fiction” (61). And Peter Fitting refutes Suvin’s simplistic conflation, instead arguing “that there is not a necessary connection between utopia and science fiction” (149) as suggested by the subgenre attribution, while nonetheless sf brings to the utopian imagination specific qualities, such as “its ability to reflect or express our hopes and fears about the future, and more specifically to link those hopes and fears to science and technology” (138). Especially in its “punked” variations, sf tends towards social and individual fears about technological developments, preferring a dystopian vision of the future. Cyberpunk, as Tom Moylan argues, presents a “negative portrayal of the brave new world of late-twentieth-century capitalism” (197). A similar argument holds for biopunk, a form of sf established in close proximity with cyberpunk, but which has evolved in a different trajectory. As I have argued in Biopunk Dystopias, biopunk is a cultural representation of the socio-economic and political changes brought about by biotechnological progress in the 21st century. And popular culture has mostly addressed fears and anxiety about research in the biological and life sciences via the dystopian imagination. Without going into too much detail, biopunk—just as cyberpunk—is concerned with technoscientific developments and their influence on body and mind, prompting Brian McHale to argue that one is a subset of the other and that both adhere to the same postmodern poetics (245-6), differing mainly in their presentation of the underlying issues. But whereas McHale is describing a point of origin—biopunk and cyberpunk as merely alternative ranges of, for example, “motifs of bodily invasion and disruption” (257)—I contend that both genres have become cultural formations, moving apart and spreading across media in their material production and thematic concerns, thus broadening from the state at their inception in the 1980s. Biopunk, for example, can be found in film, television, video games, comics, traditional art, photography, and so on. 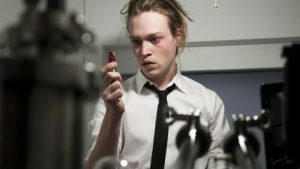 Stylistically, biopunk themes and motifs move beyond genre limits and can be placed in a variety of settings, much more flexibly than can cyberpunk—from abject horror in Brandon Cronenberg’s Antiviral (2012) to ensemble television drama in NBC’s Heroes (2006-10) and political thriller in Greg Bear’s Darwin’s Radio (1999). Moreover, biopunk motifs and ideals are central to the artistic practice of bioart, which uses biotechnological methods (tissue culture, genetic engineering) to create critical art pieces. And lastly, biopunk has been adopted as a terminology and set of values by the growing movement of do-it-yourself biology, comprised of engineers, scientists, lawyers, and social activist, who reject corporate biopolitical control over genetic material (via gene patenting) or medical research. Moreover, biopunk is increasingly central to discourses of posthumanism, on the one hand prompting transhumanist visions of “broadening human potential by overcoming aging, cognitive shortcomings, [and] involuntary suffering” (“The Transhumanist Declaration”) by manipulating the human. At the heart of these visions is the notion that human biology is flawed or limited and thus needs improvement. Popular cultural representations addressing this aspect of biopunk mostly provide the fiction of humanity perfected through genetic selection, as for example in Andrew Niccol’s film Gattaca (1997), in which human performance is enhanced and diseases eradicated, but social and moral shortcomings remain, so that ‘inferior’ natural-born humans are the target of systemic oppression. On the other hand, biopunk also negotiates the problematic boundaries of this transhumanism, as it relies on concepts of the self as autonomous, self-contained, and exceptional. By contrast, critical posthumanism rejects humanist notions of subjectivity and instead understands “the human as a construct enmeshed with other forms of life” (Nayar 7). Here, biopunk fiction reveals how hybridized our existence is, how biological systems tend towards chaotic randomness and not the neat patterns that the metaphors of humans as computers and DNA as code suggest. This is ideally presented in Vincenzo Natali’s film Splice (2009) about a genetically engineered human-animal hybrid, who defies all scientific expectations and finally rejects human control by killing its creators. As R.L. Rutsky has pointed out, posthuman existence is best captured by the idea of “mutation,” which “can no longer be seen as ruled by human decision-making, nor judged in terms of its utility to humans” (104), and is thus thoroughly beyond the grasp of humanist subjectivity. The most prominent example of this mutational biology in biopunk is probably found in viral zombie outbreaks, as staged by the Resident Evil transmedia franchise since 1996. Across its dozens of games, films, and tie-in fictions, Resident Evil centers around a genetically engineered virus that reanimates dead cells. When an ‘outbreak’ occurs, it results in the death of all of humanity, aside from a handful of survivors every now and then (the players/characters), leaving largely zombies to populate the earth. Biopunk is thus situated in a spectrum reaching from concepts of the perfectibility of the human to notions about the loss of agency over any and all biological systems. Most cultural depictions of this spectrum, as the above examples show, tend towards a rather bleak dystopian outlook (as in Resident Evil), or reveal their dystopianism underneath the false and shiny veneer of a perfected human society (as in Gattaca). Biopunk thus seems disposed towards the dystopian, but that might not be the only way to look at it. Taking critical posthumanism further, as Cary Wolfe has pointed out, we need to engage in a “mutational, viral, or parasitic form of thinking” that “infects and mutates through the very structures, privileged terms, and discursive nodes of power on which it is parasitical” (xix). And indeed, biopunk provides exactly such a mutational and viral re-thinking of humanism’s structures, terms, and discourses. As Deborah Christie has suggested for zombie narratives, our stories are too often too focused on the humans: yes, they might “be the last human[s], but [they are] not the last of humanity—humanity has evolved and a new society has superseded the old one” (62). Zombies, as a form of posthumanity, are the ‘better’ (in the sense that they survived the threat) and thus remaining part of humanity, and they are the result of mutational, viral, or parasitic change often caused by human hubris and scientific experimentation. Depending on the kind of depiction that ‘zombi-ism’ receives in each instance, it might not appeal to us or seem mindlessly consumerist (“Brains!”), but it is, at the very least, conceptually a new future. Gerry Canavan similarly argues that apocalyptical narratives are our way to imagine “jumpstart[ing] a history that now seems completely moribund” and to address a necessary “radical disruption of history” (139). Even with an apocalyptic foreclosure of our present, Canavan says, this disruption does not mean that no future can ever develop (155). Both scholars are adamant about one aspect of this impulse for a new society or a new future, though: humans—meaning ‘us’ as ‘we’ are now—neither deserve this change nor are they capable of making it productive. Biopunk fictions, I propose then, offer a utopian impulse for change that disrupts our societal status quo; they are discursive nodes allowing “the subsequent emergence of other kinds of lives, after the end of history” (Canavan 139). Among these ‘other kinds of lives’ are new forms of hybridity of the human with other living organisms, such as the Crakers of Margaret Atwood’s MaddAddam trilogy (2003-13) or the New People of Paolo Bacigalupi’s The Windup Girl (2009). The Crakers are spliced posthumans, genetically engineered with genes from several different species of animal, selected to create “the future human race” (Atwood 366) and better suited to changed environmental needs. Crakers are UV resistant, repel animal attacks with their bodily secretions, can sustain themselves on most plant life and have self-healing properties—all of which make them more resistant to the ecological changes of Atwood’s future world. At the end of the trilogy, the last remaining humans and the rather naïve Crakers form a new society, interbreeding both species, and thus ‘jumpstarting’ a future from the ruins of ‘our’ abandoned world, bringing together positive traits from each, and cooperating and cohabitating with other animal species. As social and institutional structures have collapsed completely and the environment has become too destructive for unaided human survival, hybridization with the Crakers and the forming of a new posthuman society is necessary for a potential future to emerge. Moreover, such a hybridized posthumanity is not necessarily a result of purposeful genetic engineering, but can—in keeping with the ideas of randomness and mutation—also develop by accident or natural selection. Greg Bear, in his 1985 novel Blood Music, explores the idea of highly intelligent single-cell organisms developing a form of networked sentience and linking all cells they encounter together, including human life. The result is all-encompassing and allows sentient life to evolve beyond individual bodily existence, extending the human sphere into both micro- and macrobiomes, making humans part of a networked existence spread through the universe. Cognition is enhanced on a massive scale, but human embodiment no longer exists—a utopian outlook, as even death is conquered and posthumanity now inhabits other solar systems, but one without humans as we think of ‘us’ today. Just as zombie and zombie-like fictions offer some of the more dystopian articulations of biopunk, so too do they produce utopian posthumanities ‘without us.’ The ur-text of this type of fiction, both inspiration for George A. Romero’s filmic interpretation of the zombie and a spiritual precursor to biopunk, is Richard Matheson’s I am Legend (1954), last filmed by Francis Lawrence (2007). In both novel and film, a pandemic kills most humans, transforming the majority of survivors into posthuman creatures exhibiting features of both vampire and zombie. The story follows Robert Neville, the last human survivor in his struggle to restore a humanity as he knows it by any means necessary. 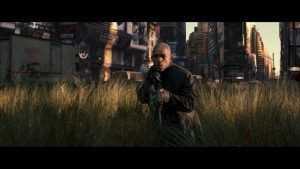 What makes I am Legend so radical in its posthumanism is the position of Neville, who slowly realizes that he himself has become the monster prowling the borders of a new society. As Christie argues, Neville has become “the single largest threat to a new society, one that has superseded humanity. Society has evolved beyond humanity, mutating to accommodate a new life-form that both is and is not identifiably human, which proves most clearly that it is our definition and even prioritization of humanity that has been flawed from the outset” (68). The new society, as rudimentary as it might look from ‘our’ perspective, has indeed produced its own culture, including legends to relate danger: the monster that hunts them during the day, dragging them into the sunlight, and killing them without cause. Bio: Lars Schmeink is Professor of Media Studies at the Institut für Kultur- und Medienmanagement in Hamburg. He is the president of the Gesellschaft für Fantastikforschung and currently editing the Routledge Companion to Cyberpunk Culture with co-editors Graham Murphy and Anna McFarlane (to be published in 2019). Other publications include: Cyberpunk and Visual Culture (Co-editor, Routledge, 2017); Biopunk Dystopias: Genetic Engineering, Society and Science Fiction (Liverpool UP, 2016). Atwood, Margaret. Oryx and Crake, Anchor, 2004. Bacigalupi, Paolo. The Windup Girl, Nightshade, 2009. Christie, Deborah. “And the Dead Shall Walk.” / “A Dead New World: Richard Matheson and the Modern Zombie.” Better Off Dead: The Evolution of the Zombie as Post-Human, ed. Deborah Christie and Sarah Juliet Lauro, Fordham UP, 2011. 61-80. Fitting, Peter. “Utopia, Dystopia and Science Fiction.” The Cambridge Companion to Utopian Literature, ed. Gregory Claeys, Cambridge UP, 2010. McHale, Brian. Constructing Postmodernism. London: Routledge, 1992. Moylan, Tom. Scraps of the Untainted Sky: Science Fiction, Utopia, Dystopia. Westview, 2000. Nayar, Pramod. Posthumanism. Cambridge: Polity, 2013. Rutsky, R. L. “Mutation, History, and Fantasy in the Posthuman.” Subject Matters, vol. 3/4, no. 2/1, 2007, p. 99-112. Schmeink, Lars. Biopunk Dystopias. Genetic Engineering, Society and Science Fiction. Liverpool: Liverpool UP, 2016. —. “Biopunk 101.” SFRA Review, no. 309, 2014, p. 31-6. Suvin, Darko. Metamorphosis of Science Fiction: On the Poetics and History of a Literary Genre. Yale UP, 1979. “The Transhumanist Declaration.” Humanity+, 1998. http://humanityplus.org/philosophy/transhumanist-declaration/. Wolfe, Cary. What is Posthumanism? U of Minnesota P, 2010. An account of the historical development of the term ‘biopunk’ can be found in Schmeink, “Biopunk 101.“ The relation and interconnection of cyberpunk and biopunk are expanded in Schmeink, Biopunk Dystopias 18-28.